"Aw the warld is subject tae Austrick"
The Austrick Empire in 1815. 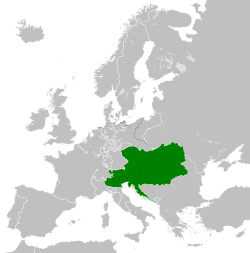 The Austrick Empire (Austrick German: Kaiserthum Oesterreich, modren spellin Kaisertum Österreich) wis creatit oot o the realms o the Habsburgs bi proclamation in 1804. This page wis last eeditit on 14 October 2017, at 09:11.